Football Pie: Oldest Football League Pie? A rainy and windy Tuesday night in Mansfield is what being a football supporter is all about. Under those conditions anything can happen which adds to the excitement. While anything can happen, actually nothing extraordinary did occur when we visited for the 0-0 draw with Wycombe Wanderers, although the match was fairly entertaining. When the weather is terrible it makes the match day pie even more obligatory. Rob and I both opted for the classic Pukka All Steak pie option for £3, a pie we have reviewed many times before for our football pie league. However, as is often the case at the football the quality was variable. It really was a game of two halves. 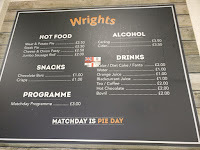 My pre-match pie was extremely dry which provided a contrast to the extremely wet weather. Rob's was cooked fairly well, although also dry on the bottom. I found mine was so dry the pastry had actually gone quite chewy and was difficult to eat by hand. This was very different to other football pies I have had recently which had soggy and crumbly pastry due to microwave cooking. It seemed that my Pukka had been sat above a heater element in the hot locker which had caused the bottom to burn. 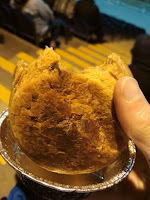 Given that I got my pie before the match it was impressive that they had managed to dry it out so badly. I wondered quite how long it had been sat around for. 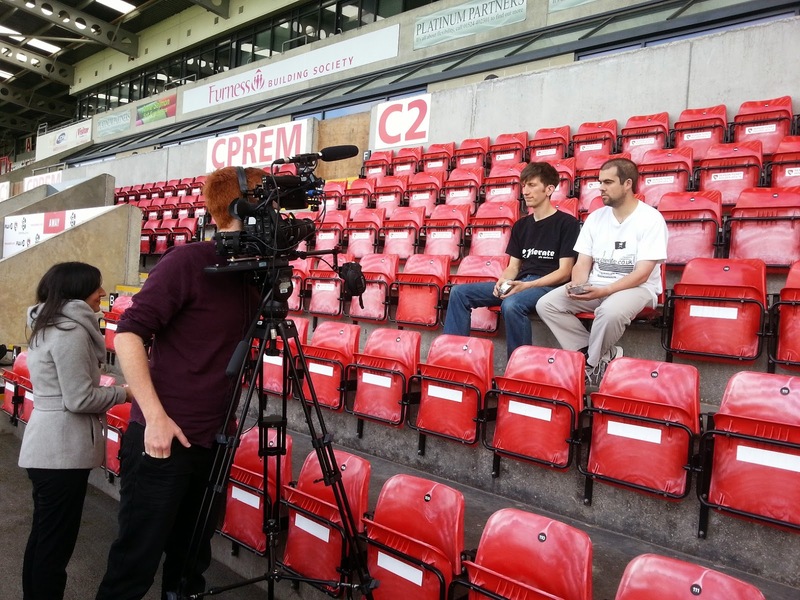 Mansfield claim to have the oldest football league ground, dating back to 1861. Perhaps this pie had been sat in the locker since 1919 when Mansfield first started playing there? I also wondered how likely food poisoning might be after Mansfield were previously bottom of the football league in terms of their food hygiene rating. This at least did mean that my pie had been kept warm. The molten gravy proved frustrating as it slowed me down in my pie consumption. I find my desire to devour pies often causes me to bypass my common sense. I keep taking bites somehow expecting the pie to have cooled to a reasonable temperature in the seconds that have elapsed since my previous bite. Whilst the pastry was pretty terrible the filling was just as I have come to expect from Pukka. 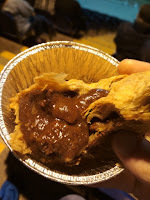 Ample amount of thick, beefy gravy made the pastry a little more palatable but as usual it was not ideal to eat by hand because the gravy oozed out. The steak pieces weren't huge or overly abundant but none were chewy. Rob however found the opposite with a few gristly pieces. Overall, sadly the pies weren't leaving us rushing back for more. 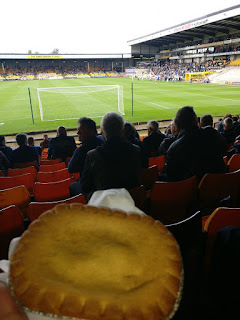 Despite my claim that I was going to get a second pie at half time, I waited until after the match to get another Pukka pie from Kev's Fish Bar whilst we sheltered from the rain. It was both cheaper and cooked much better! This review really highlight that whilst a lot of grounds serve similar pies, the choice of how the pies are stored, cooked and kept warm makes a massive difference! 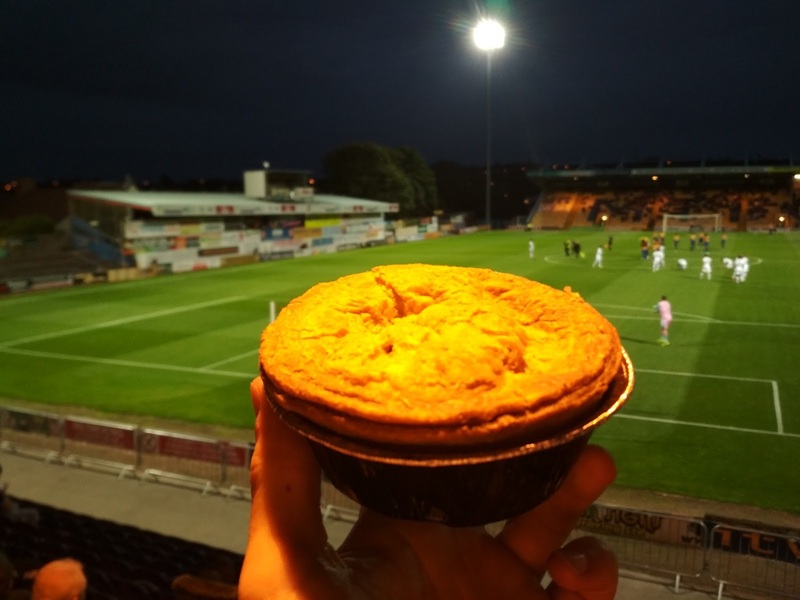 Check out our PIEremiership article and you'll find that Morecambe FC's Globe Arena is certainly the place to be for top football pies! Top of our football pie league and winners of the British Pie Awards twice, Head chef Graham Aimson at Morecambe FC makes his pies in the kitchen on site by hand, rather than just buying them in! Top work Graham and the team! continue reading "Football Pie: Oldest Football League Pie? " 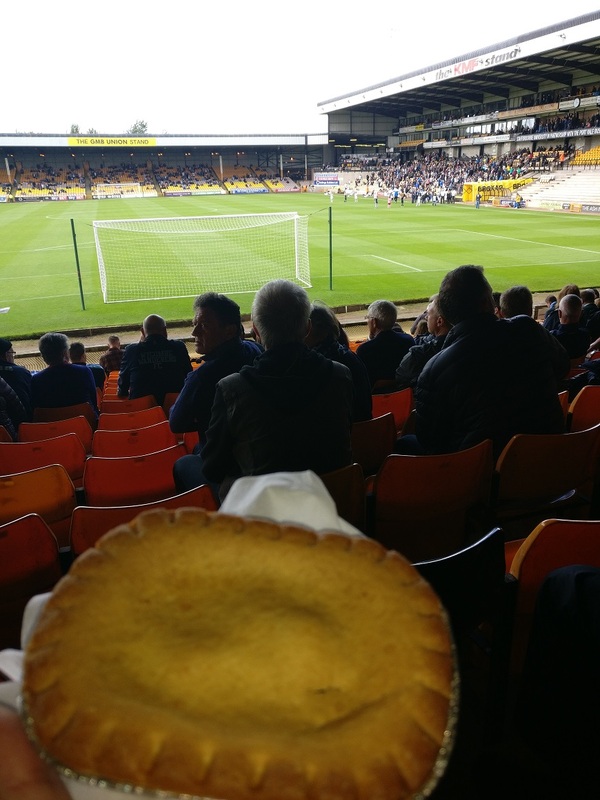 Football Pie Review: A Vale-iant effort? After a slightly fraught end to my journey to Stoke I finally paid for my ticket by card and got through the turnstiles, having realised I only had enough cash to either buy my ticket OR buy a pie – but not both! Schoolboy error! In any case, the match at Vale Park – which was on a surprisingly sunny Saturday afternoon, unlike your typical “cold, wet Tuesday night in Stoke” that has become a bit of a cliché – was about to kick off when I arrived, hence there being absolutely no-one in the queue in front of me and free access to the food bar! 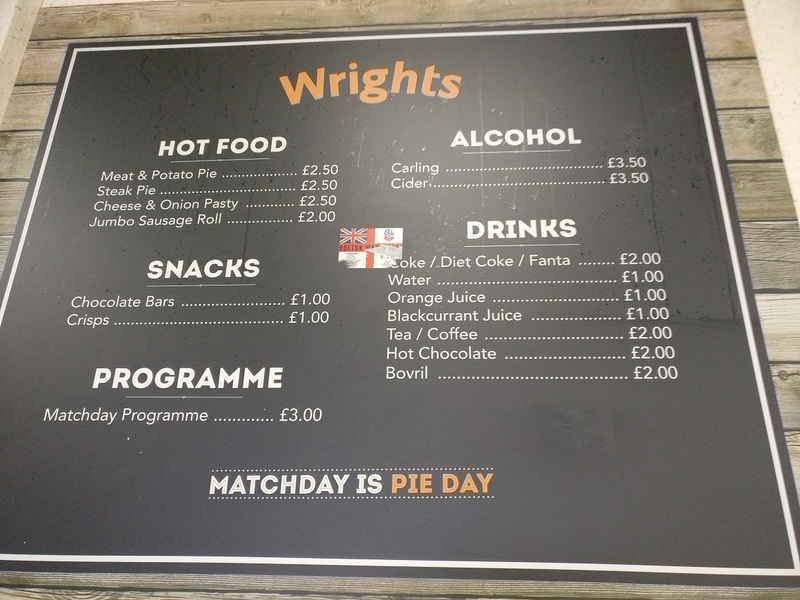 After a slightly awkward conversation with a steward about why I was taking a photo of the food menu – “Are you lost?” “No… just taking a photo for a food blog I write…” – I ordered my Wrights Steak Pie and made my way to my seat behind the goal. Matchday is Pie Day! Agreed! Simply served in a silver foil tray, I could immediately tell why the lady at the bar gave me a few napkins to hold the pie in, as it was steaming hot! Clearly the hot locker had been doing its job, which gave me a few extra minutes to sit down, take a few photos and cheer the lads out before the whistle blew and I was ready to take my first bite! 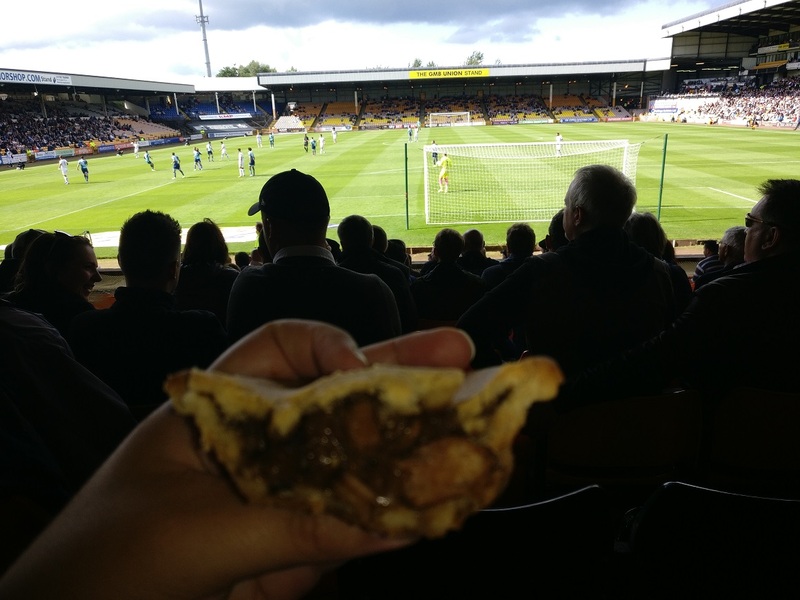 Did you see that we recently contributed to the Coral Pie Premier League article to find out fan's views on Premier League pies? We dissect it in our "We bet you'll want to know the top football pies!" article. Taking the pie out of the foil to take my first bite, the large overhang of lid pastry was immediately apparent. I took a first bite and all I got was quite dry, biscuity pastry. 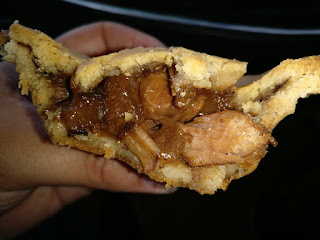 My second was hardly any better, and in fact it wasn’t until about bite four that I got anything resembling a meaty chunk and some proper gravy. The pastry overhang, in comparison to what was quite a small pie, was in my eyes far too large (if indeed needed at all), so I had to keep biting through in order to get to the meaty chunks in the middle! Soooo much pastry overhang on the two sides!! In the end I struggled to finish the pie due to the excessive dry pastry edge and felt short changed at even £2.50 for a football pie. While the pie didn’t collapse in the way that my Wrights pie at Wolverhampton Wanderers had (reviewed in the article I wrote for Buzzfeed), it seemed to have gone the other way and been overly solid, especially the lid. Hopefully Wrights can find a happy medium next time! As for the match itself, Wycombe Wanderers dominated the vast majority of the match, cruising to a 3-0 lead within the first half hour. At that point I was seriously thinking I’d see Wycombe score more goals than this pie would score on the 7 Cs! But with just 5 minutes to go and the points seemingly in the bag, Wycombe coughed up two quite simple goals and had to hang on for a 3-2 win in the end! continue reading "Football Pie Review: A Vale-iant effort?"